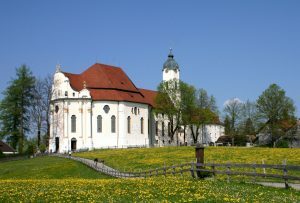 The world-famous “pilgrimage” church in Wies, near Steingaden, was formed as part of a collaboration between two brilliant artist brothers, architect Dominikus and painter and stucco plasterer Johann Baptist Zimmermann. 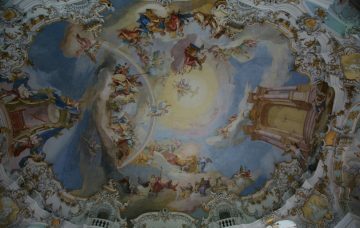 The Bavarian Rococo style reached perfection in the Pilgrimage Church of Wies (1746-57). Quite rightly, this unique creation of holy architecture has made it onto the UNESCO World Heritage list. Enjoy the congenial synergy between architecture, colour and penetrating light. Wallfahrt-Museum Wies is open between 3 pm and 5 pm every month. 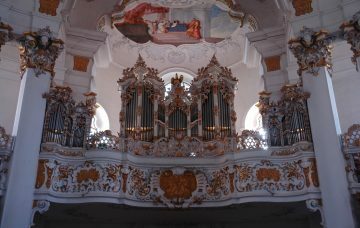 or the “Musik im Pfaffenwinkel” concert: www.musikimpfaffenwinkel.de ).